Walter McDougall begins his sober analysis of civil religion and American foreign policy with a quotation from James Wilson, Pennsylvania delegate to the Continental Congress and the Constitutional Convention, and subsequently Supreme Court Justice and professor of law at the College of Philadelphia (the ancestor of McDougall’s own University of Pennsylvania). Reaching all the way back to Socrates’s famous injunction quoted from the Temple at Delphi, Wilson warned that “a nation ought to know itself.” In fact, he called such self-knowledge “a duty” incumbent on any people. The pursuit of national self-knowledge has animated much of Professor McDougall’s work over the years, and now in The Tragedy of U.S. Foreign Policy he continues that task in a way that draws together much of his previous scholarship. Self-knowledge is not a once-for-all thing, not for individuals and not for nations. The wisdom demanded in 1787 or 1898 or 1917 is not the same as what is needed today. Too much has happened to America and its standing in the world. Civil religion itself has been changed to accommodate America’s transformation over time, and along the way it has been turned to purposes for which it was never intended—and indeed which it was cultivated precisely to prevent. Many of the words and symbols have stayed the same, but they have been emptied of their content and robbed of their power to contain destructive aspirations and behavior. America’s policymakers exchanged liberty for power and had to reinvent American civil religion to do so. And therein lies the tragedy. 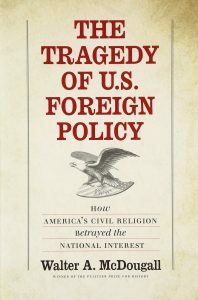 Instead of promoting self-knowledge (which takes courage for nations as well as for individuals), American civil religion now promotes what McDougall calls “delusional” and “magical” thinking for a world of make-believe in which all that is required of citizens and their leaders is a vacuous “faith in faith” or “faith in America,” with “America” having no stable identity. The pious smokescreen of modern civil religion makes it possible to believe that America’s conduct as an expansive, interventionist, nation-building apostle of global democracy is in fact a fulfillment of the Founders’ vision and not a betrayal. The imperialists of 1898 and Woodrow Wilson in 1917 performed this conjuring trick, and many American’s found it seductive. Many still do. University of Toronto political philosopher Ronald Beiner defines civil religion as the “appropriation of religion by politics for its own purposes.” This definition handily gets at one important side of civil religion: the state’s mobilization of religion to advance its power, whether domestically or internationally. This definition works well as far as it goes, but if we rely too much on it we might miss something important. Civil religion need not be intrinsically religious at all. It can also comprise a set of principles or affirmations elevated to the status of a civic faith meant to bind a people together. Secular heroes, events, documents, and principles can all serve as useful symbols and dogmas that bind a people together by means of common affections that help keep them safe, free, and prosperous. At least that’s the hope. Such a civil religion need not appropriate any group’s sacred texts, doctrines, rituals, or saints. If fact, the less it does so the healthier it is for both politics and religion. It need not pretend to be the highest or ultimate affection of the human heart. It need not compete with other bonds of affection. Civil religion in this sense need not become an idol, need not compete with or substitute itself for historic faiths and institutions. So much for theory. In practice, these two kinds of civil religion became jumbled together. Civil religion as we experience it operates as a two-way conduit through which religion flows freely into the state and the state into religion. Nations ancient and modern have resorted to some kind of civic faith in order to explain themselves to themselves and to the rest of the world, especially in times of crisis. The will of the gods or God is always a handy justification. That need becomes most urgent in the emergency of war when the stakes are very high. Indeed, war has been the most productive factory of civil religion. America is no exception. Every one of America’s wars has churned out an abundance of civil religion to meet the demands of U.S. policy objectives. But what exactly are those demands, and who is making them, and to what purposes? These are the critical questions McDougall forces readers to confront. Civil religion can serve (and once did serve, McDougall argues) to promote the health of America, keeping it safe, promoting its interests, and sustaining its institutions, while at the same time doing minimal damage to genuine historic faiths such as Christianity and Judaism. McDougall is always careful, however, to emphasize that America has always been “split-minded.” The nation has always had to wrestle with visions of grandeur and even millennialist dreams. But the United States practiced “self-containment” for generations (one of the most arresting ideas in McDougall’s book), and it developed a civil religion of restraint that helped it do so. But over the years, especially after the War of 1898 with Spain and the conquest of a Pacific empire, the “thou shalt nots” delivered by George Washington were turned into “thou shalts.” Where the nineteenth century had promoted liberty for America, unilateralism, the New World as a sphere of interests distinct from the Old World, and continental expansion for the sake of security and prosperity, the twentieth century embraced liberty for others, entanglement in alliances, something called “world order,” and global meliorism. McDougall divides the American civil religion (or what he simply calls the “ACR”) into three phases: The Classical ACR articulated by George Washington; the Progressive ACR launched by William McKinley and perfected by the high priest Woodrow Wilson; and the Millennial ACR that emerged in the 1990s and sputtered in fits and starts through the administrations of George W. Bush and Barack Obama. Every one of these instantiations of the ACR has moved into a “neo” phase when it proved expedient to do so, McDougall argues. And he keeps open the question of whether today we ought to expect a “neo-Millennial ACR” that will aim at nothing less than a global civil religion, the very thing Robert Bellah envisioned as the authentic fulfillment of the ACR fifty years ago when he founded the modern study of civil religion. McDougall subdivides these epochs in ways I will leave to the reader to discover—and I am far from doing justice here to the nuances and complexities of McDougall’s achievement—but it is worth noting that this book appeared just on the eve of Donald Trump’s election in 2016. It is impossible while reading this book not to think about Trump and what he portends for the future. What will Trump do, intentionally or unintentionally, to the ACR and foreign policy? As far as the ACR itself goes, candidate Trump made little use of the Bible in his campaign, and even avoided the “city on a hill” of Ronald Reagan, though he certainly preached a robust faith in America itself. But at the moment of his inauguration President Trump seemed to lose whatever civil religion inhibitions (or tone deafness) he had. His inauguration ceremony turned out to be a carnival of civil religion. The great national worship service on the Washington Mall made its predecessors seem downright restrained by comparison. It is still not clear which version of the ACR Trump’s foreign policy will deploy, and whether his ACR looks to an earlier epoch for inspiration, becomes its own historically distinct version, or pulls America back from the precipice of its Millennial ACR—and, if so, whether any second thoughts turn out to be a temporary blip or an enduring reworking of the ACR. My own sense is that the United States is entering a post-ideological epoch, and if that’s true the ACR will change. But it might be too much to expect at this late date that any President could rearticulate a classical ACR for the sake of a “classical” foreign policy. There are many more reasons to read this book: McDougall confronts readers with the hard question of what American citizens ought to do now that their civil religion undermines their national interests. He raises, and in a powerful way, the question of how we define national greatness. He reminds us that policymakers have always faced options. They have never been the victims of fate or the playthings of historical inevitability. They could have chosen otherwise at every critical moment in our past. Human agency and not fatalism lies at the heart of McDougall’s story. His attentiveness to the open-endedness of history means that this book is ultimately not a tale of doom and gloom. We can still make good decisions in difficult times. Nonsense has always been optional. McDougall’s skills as a historian, student of foreign policy, and writer are on full display here. He has produced a work of wit and energy. His gift for memorable turns of phrase, his master craftsmanship, and his wide-ranging and deep knowledge of history make this book a pleasure to read. Its moral seriousness makes it unforgettable. Richard M. Gamble is Professor of History and holds the Anna Margaret Ross Alexander Chair in History and Politics at Hillsdale College. His books include The War for Righteousness: Progressive Christianity, the Great War, and the Rise of the Messianic Nation (ISI Books, 2012), The Great Tradition: Classic Readings on What It Means to Be a Human Being (ISI Books, 2007), and In Search of the City on a Hill: The Making and Unmaking of an American Myth (Bloomsbury/Continuum, 2012). Making American Sacred, a history of “The Battle Hymn of the Republic” and American civil religion, will appear from Cornell University Press in 2019.